The Russian Blue is a green-eyed, elegant cat with silvery blue-gray fur and a shy, affectionate, undemanding temperament. With its endearing personality and unique features, the Russian Blue is still relatively rare, but increasing in popularity worldwide. Known variously in the past as the Foreign Blue, Maltese, Spanish Blue, and Archangel Cat, the Russian Blue’s origins are not known for sure, though it is commonly believed that the breed originated on northern Russia’s Archangel Isles. 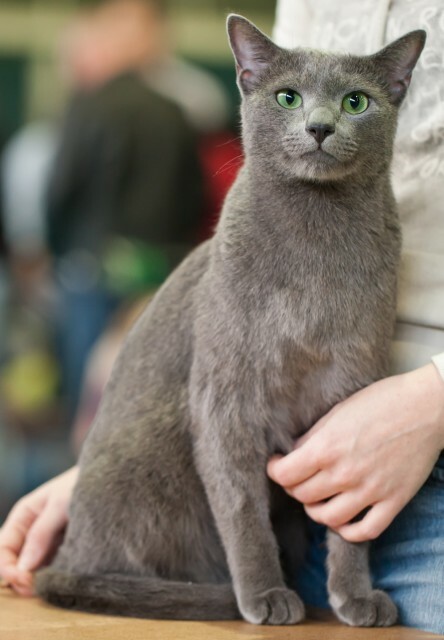 Originally, the Russian Blue competed in cat shows under the generic class covering all “blue” cats, but in 1912, the breed was recognized as distinct. After a post-war surge in popularity, the fortunes of the British Blue subsequently declined when the breed developed a reputation as difficult to show due to its profound shyness. Breeders worked to correct the shyness problem through a broad array of strategies, including selective breeding, kitten training, herbal remedies, relaxation techniques, playing tapes of various noises, visualization, and anything else that could be imagined. Eventually these efforts paid off, and many Russian Blues became as pleasant at cat shows as they were at home. Subsequently, their appeal to both spectators and judges increased, and these beautiful cats achieved six national wins between 1981 and 1990. The Russian blue has a solid blue-gray coat of short, dense fur with silver tipping that gives the cat a silvery sheen, and a thick undercoat of fine wavy hairs, creating a silky, plush feel. Kittens may have ghost tabby markings that disappear over time. While North American registries only recognize the blue-gray coat colour, cat registries in other countries such as Australia recognize additional colours such as black and white. A remarkable feature of the Russian Blue are its emerald green eyes, set far apart on a head that has been described as “cobra-like” due to its unique shape. In addition, the cat sports a subtle “Mona Lisa smile,” with the corners of its mouth slightly upturned. Also distinguishing the purebred Russian Blue from mixed-breed cats with gray fur is that its footpads are mauve rather than the more common slate gray. The face of the Russian Blue is wedge-shaped, with wide-spaced, broad ears set on an angle. The elegant body is fine-boned, long, and muscular, with a long, slender, tapering tail. 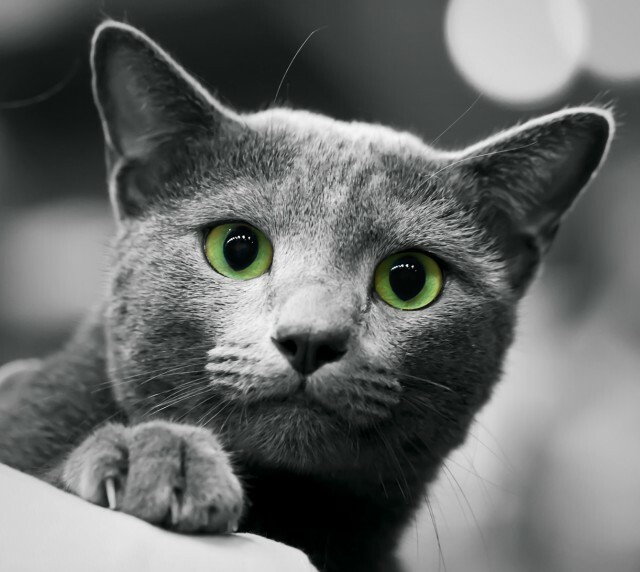 These features differentiate the Russian Blue from other blue purebred cats, such as the much stockier Chartreux and blue British Shorthair, and the slightly more solid Korat. The Russian blue tends to be gentle and sweet-tempered. Playful and clever, Russian Blues usually delight their owners with clownish antics and have no trouble figuring out how to open cupboard doors. Russian Blues are very affectionate with those they know well, but tend to be reserved around strangers and usually prefer to hide rather than socialize when new people visit. It takes Russian Blues longer than cats of other breeds to accept new people, but once they do, they are very loyal and loving. Russian Blues tend to be demure, quiet, and undemanding. Known for their sympathy, they will often pat an owner’s face in an attempt to cheer him up when he is sad. Though there are certainly exceptions, Russian Blues tend to get along well with other pets and children. If children handle them clumsily, most Russian Blues will escape and hide rather than strike back. Russian Blues don’t cope well with changes to routine, so disruption should be kept as minimal as possible. They are also quite sensitive, so a simple “no,” will usually be sufficient to discourage undesirable behaviour, and if laughed at, they don’t easily forgive or forget. Among the more self-sufficient cats, most Russian Blues can spend some time on their own each day without becoming depressed, as long as they are provided with an enriched environment. They are good at entertaining themselves and quite active, though not as much as the Siamese and other Asian breeds. Russian Blues tend to follow their owners around, and many also enjoy perching on their owners’ shoulders and showing affection with forehead kisses. Although daily grooming is not required, Russian Blues usually enjoy being brushed. Russian Blues are not prone to any particular genetic health problems, and tend to be quite hardy. Barring accident or disease, indoor Russian Blues enjoy an average lifespan of 10-15 years (outdoor cats die far earlier on average). The cost of Russian Blue kittens varies depending on bloodlines and other factors. The price of pet-quality Russian Blue kittens is usually around $400-$700, whereas show quality range from $800-$2,000. Most reputable breeders maintain waiting lists due to the relatively rarity of the breed. Potential adopters should wait for kittens from legitimate breeders rather than simply grabbing the first kittens that become available. Because Russian Blue kittens tend to be naturally shy, timidity around strangers does not necessarily indicate that they will not make good pets. They just take longer to forge a bond than cats of most other breeds. Good early socialization practices when they are kittens can create a well-adjusted and less timid personality. Those who wish to save money and provide a home for an adult Russian Blue cat in need should contact Russian Blue Breed Support or visit PetFinder’s list of Russian Blue shelter cats available for adoption. Lynch, Jo-Anne, Canada’s Cat Registry. (2006). “Russian Blue.” CCA-AFC.com. Helgren, Anne, J. (2009). “Choosing a Russian Blue.” PetPlace.com. Johnson, Peg, Cat Fanciers’ Association. (15 June 2009).“Breed Profile: Russian Blue” and “Breed Article: Russian Blue.” CFAinc.org. As for the leanness, if a cat suddenly starts losing weight, that can be a sign of a medical condition (particularly in an older cat), but if he has always been lean, it may just be his metabolism. I recommend taking him to a vet if you have concerns, particularly if there are any additional symptoms of illness.